Where weddings are more fun! Some brides-to-be may ask ‘do we need to send save-the-dates?’ Yes, you should especially if you want them to block their schedules on your chosen day to be there on your wedding day. Without a save-the-date card, how will you tell them the wedding will be in Santuario de San Antonio on July 22, 2015, 3pm? Would you rather hear your friends tell you ‘Oh we have to skip your wedding because of the Paris trip we planned months ago.’ Heartbreaking, isn’t it? Now that you’ve finally decided to send save-the-dates, avoid these grisly mistakes. The rule of thumb when sending save-the-date is the earlier, the better. Early notifications will guide your guests as to when they should file their vacation leaves earlier and arrange their travel plans and accommodations. Wedding experts say that the best time to send save-the-date cards is 5 to 6 months before the wedding day. That’s the safest time allowance whether the wedding will be a local or destination wedding. Not because they are just save-the-dates, you will send just about anything that comes to your mind. 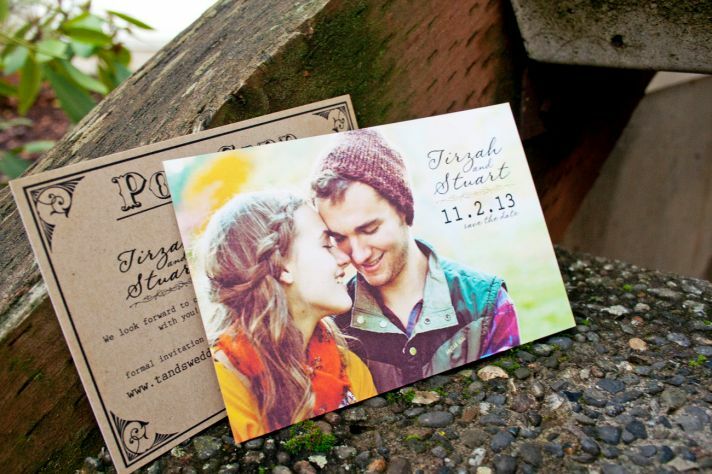 It would better to send save-the-date cards that fit your chosen theme wedding. Look for inspiration online. Remember that the save-the-date is your guests’ first glimpse of your wedding. Build the excitement by teasing them with the design of your save-the-date card. Don’t forget to write the names of the recipients; they will surely appreciate that you took the time putting or printing their names on the envelope or the card itself. Drop the ‘Surname and Family,’ and be specific with names. Be clear on who you are inviting. At this stage, you may tell your guests if your wedding will be an ‘Adults Only’ event. With this, they can arrange for babysitting early on and not skip your wedding because they cannot leave their tots behind. Possibly, decide on the location first before sending your save-the-dates. Remember that your guests need to get a leg-up in planning accordingly especially if your wedding will be a destination wedding. People will assume that you will marry somewhere near your place, but this is not always true, right? There is no need to include unnecessary details such as registry info and directions. Include the type of celebration, that is if the wedding is a weekday or weekend wedding and if it will be a morning, afternoon or evening wedding. If you’ve created your own wedding website, include the URL in the save-the-date. Your website will become handy in case your guests want to know about the other details of your wedding such as timeframes and pre-, during and post-wedding activities, among others. Those people who receive the save-the-date cards must also receive the invites. You cannot un-invite those who receive the save-the-dates. With this, make sure that your guest list is already settled before you send the cards. Bottom-line, don’t send the cards to anyone who you are not certain regarding inviting. If the person you sent the save-the-date to had initially declined, you still need to send him or her the invitation. Plans change, and he or she might have already regretted saying no in the first place. Response cards or RSVP cards are for invitations only and not for save-the-dates. Save-the-date cards are for announcement purposes only. So, don’t bother asking for feedbacks just yet. Optionally, you may put the phrase ‘Invitation to Follow’ to avoid confusion. Save-the-dates are the perfect way of pre-announcing that you are about to face a life of wedded bliss. However, you don’t send a save-the-date haphazardly; there are basic etiquettes to live by and mistakes to avoid. Hope the above information will help you in creating and sending your cards.